5 p.m., Base Nine Bar (Inside Beaver Run), 620 village Road. 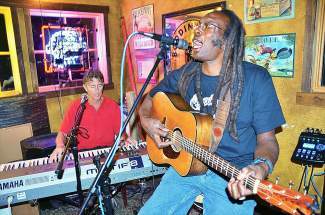 Come hear Johny Johnson play music from his new original album, Colorado Blue. Enjoy $4 snifters or Deviant Dales IPA from Colorado brewer, Oskar Blues, and listen to the roosty-blues, Colorado inspired tunes of Johnny Johnson. Tasting flights of Colorado craft beer also available as well as free pool and darts for patrons. (970) 453-6000. All Day, Copper Mountain Resort, 209 Ten Mile Circle. Copper is proud to recognize and support the National Ski Area Association’s Safety Awareness Month with Copper’s Safety Fest, featuring a month of safe skiing and riding education, demonstrations and giveaways. All Day, Keystone Resort, 100 Dercum Square. Bring the family out to participate in the 2015 Summit Cups Series. A fun free series for skiers and snowboarders under age 16. Beginners are welcome. The first event will be a Giant Slalom race. (970) 496-4000. 6:30 p.m., Backstage Theatre, 121 S. Ridge St. Written by Carisa Peterson. A tapestry of local women’s stories gathered from neighbors and friends in Summit County – is spun to create a funny and captivating story of our life and times in the high country. Some adult language. (970) 453-0199. 4 p.m., Elevate CoSpace, 711 Granite St. Ready to launch a crowdfunding campaign on Kickstarter or Indiegogo? Gabby Tinner from the Quandary Group will help demystify crowdfunding. The hows, the whys, the whats and — more importantly — the what not to do’s. RSVP: http://bit.ly/1FMD1zH.